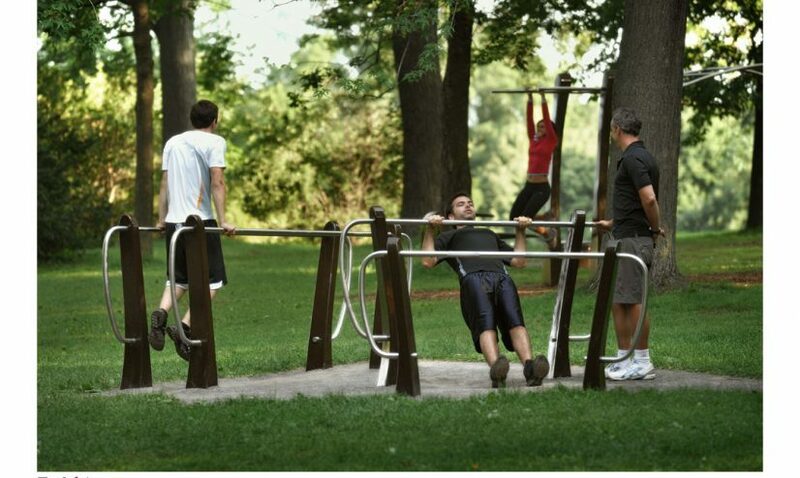 MONTREAL – Not everyone has the luxury of a gym membership, but if you look around, there are some parks with training equipment, most notably an area in Irma Levasseur park in Outremont and new circuit training system recently installed in Jean Drapeau Park on Ile Ste. Helene near the big swimming pool. 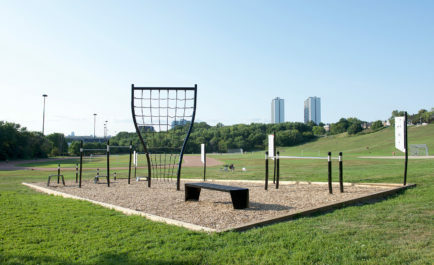 Free access to physical activity is the idea behind both of these installations, which are meant for use by people over the age of 13. 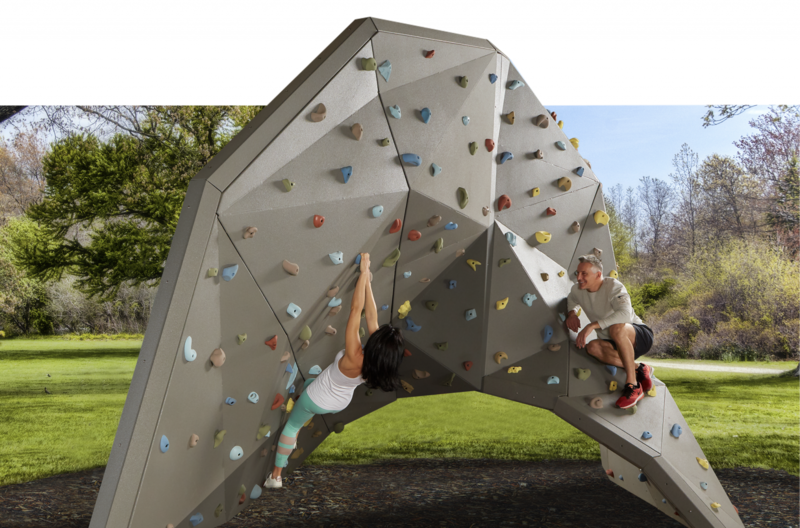 No longer just the arena of swings and teeter-totters, parks are catering to the adults, too. The Societe du Parc Jean-Drapeau, a para-municipal body that runs the facilities of the islands (Notre Dame and Ste. Helene) made a deal with a new Quebec company, Trekfit, to be the first to have a high-performance concrete and stainless steel installation that allow participants to exercise every part of the body, doing pull-ups, step-ups, squats and body dips to name a few. 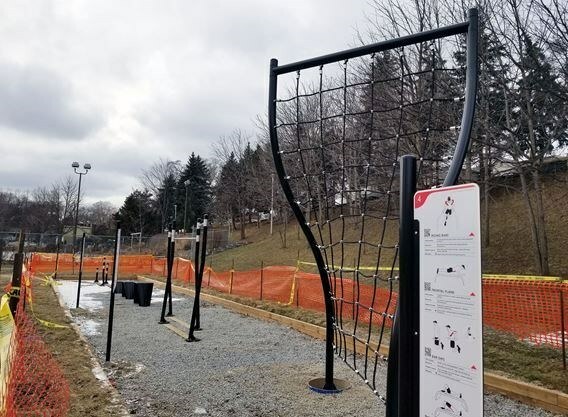 “We wanted to complement the sports centres (basin, track, pool) we already have with this kind of outdoor gym,” said park spokesperson Nathalie Lessard. Eric Tomeo, president of Trekfit, said many elite athletes train at Jean Drapeau Park -rowers, cyclists and swimmers -and having circuit training on site was a natural fit. The system also is for your average Joe and Josephine who’d like to get a complete workout, at a kinder, gentler pace. “An elderly couple and a baseball team can both use the same equipment, just at different levels,” Tomeo said. Parks, like libraries, are the responsibility of each individual borough, so Tomeo will have to make his pitch to all the boroughs and Laval for any future sales as there is no one blanket policy on park equipment. The Societe, with its seven-person board, makes its own decisions on where to spend money. Trekfit’s system normally costs $70,000, but the park paid under $30,000, a deal Tomeo said was a promotion to show other municipalities and boroughs what this kind of program is all about. 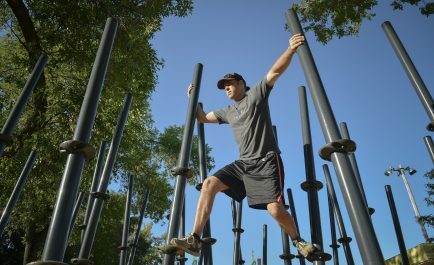 “Parks are great places to go and exercise and this gives people more ways to get fit in the open air,” Barker said. The equipment is treated with a special surface that is easy to clean, in case Montreal’s graffiti vandals come calling, Tomeo said.